Many travelers arrive to Cusco with the main objective of knowing the wonder of the modern world, Machu Picchu, but in the ancient capital of the Inca empire there are many things to know, from the same city that has a lot of attractions, the Sacred Valley of the Incas, the South Valley Cusco, the attraction of the moment in Cusco, the mountain of 7 colors, and many others more. Although a short visit to Machu Picchu is possible for only two days, this will be very fast and will not give you time to know other attractions, a 3 day trip will give you a longer time to know more, but you can still you do not get to visit and experience everything that you would like. A prudent time that will allow you to visit Machu Picchu and many of the tourist sites of Cusco and without so much haste is a 4 day trip. Many travelers usually visit Cusco, assigned 4 days for their stay. Here we offer you a travel itinerary that will guide you and allow you to visit many of the best known tourist destinations in Cusco and Machu Picchu. It is possible to make changes in the order of the times and the places to visit. It is always advisable to advise and inform yourself if you are traveling on your own. It is advisable to arrive in the city of Cusco as early as possible, as the morning is more conducive to acclimate and to cope with the effects of altitude, it is highly recommended to take a short break and drink a mate of coca, to avoid the altitude sickness. When you have passed the little trance after your arrival, you can eat something, in Cusco there are dozens of restaurants, cafes and many more places where you can taste delicious dishes and the most varied. Once this with all the energy put you can make a visit to all of Cusco city and its attractions, it is preferable to do it the first day, since this way you can fully acclimate to the conditions of the region. You can take one of the many “city tours” that are offered, a tour allows you to visit the main attractions of the city optimizing your time in addition to having a guide and some extra services. It is also possible to visit the city on your own, this will allow you to spend more time in the attractions you like and to know sites that overlook the tours, but the logistics will depend on you, the main tourist attractions of the city are located in the historic center and archaeological sites like Sacsayhuaman are located just a few minutes away, so it is not difficult to tour the city on your own. On the second day we recommend you to make a full day excursion through the Sacred Valley of the Incas, you will be able to visit enchanting places such as the village of Pisac and its traditional artisan market, as well as its Inca remains, the continuous tour through the fertile Valleys Calca and Urubamba to finish in Ollantaytambo, here you can visit its impressive archaeological site. After the visit you can stay in Ollantaytambo, or if you prefer, you can take the train at the end of the day to Aguas Calientes, that way you can spend the night in Aguas Calientes and so the next day go very early to Machu Picchu. It is possible that you can make the tour of the Sacred Valley on your own, but it will require your expertise as a traveler or have a person to guide you along the route. By scheduling your time well you can visit more places of the Sacred Valley like Chinchero, Maras or Moray. Continuing with the itinerary, is the day so longed for by all, the moment you can visit Machu Picchu, the fabulous city made by the Incas. If you spend the night in Ollantaytambo you must board the train very early to the village of Aguas Calientes. From Aguas Calientes take the buses to Machu Picchu, the bus stop is very close to the train station. 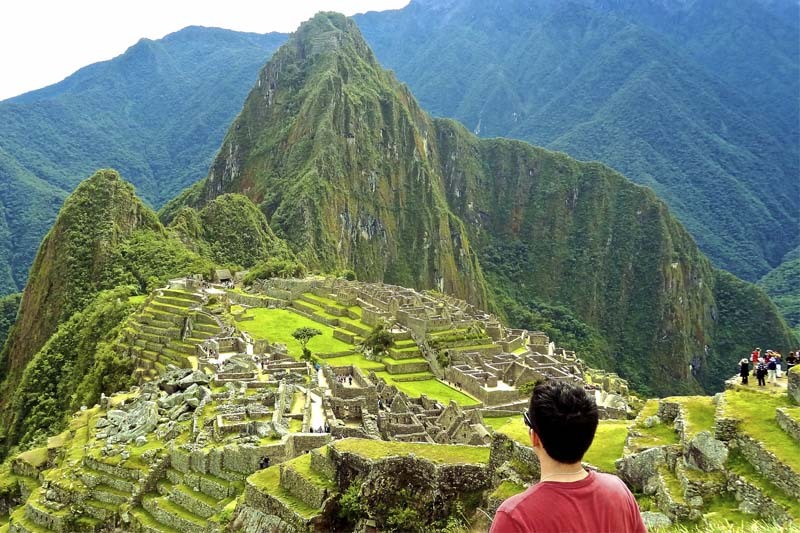 If you have a ticket that includes some of the mountains of Machu Picchu and in the first hour or if you want to see the sunrise, you must climb to the Inca city very early. The buses will leave you very close to the entrance to Machu Picchu, to enter you must show the print or copy of your ticket Machu Picchu and your personal documents (Passport, DNI, University ID Card, etc. ), and after that you will only prepare your senses to marvel at the jewel of the Incas. Hiring a good guide will help you to know Machu Picchu better, you can hire one to enter the city, but if you come on an organized tour of insurance already has it included. Take your time in the Inca city, enjoy its incredible architecture and the beautiful landscape that surrounds it. It will be an experience you will never forget. And do not forget to take some forecasts before visiting Machu Picchu. Back to the village of Aguas Calientes you can eat something and assimilate the intense emotions that usually generate the Inca city of Machu Picchu. The usual thing is, whether on your own or on an organized tour, take the train back to Ollantaytambo the same afternoon, from here take the mobility that will take you back to Cusco. So you can rest after an extraordinary day and get ready to take advantage of your last day in Cusco. Your last day will allow you to know other tourist places, or if you want to know more in detail the city of Cusco. We recommend you to take a tour of the South Valley of Cusco. If you are more adventurous and can get up early enough you can visit the spectacular Seven Colors Mountain or Vinicunca mountain, the destination of the moment in Cusco, there are one-day tours that will take you to this fantastic place. And in this way end 4 days in which you can enjoy and know several of the attractions offered by Machu Picchu and Cusco. But they are not the only ones, there are many other attractions in Cusco, but they demand more time to stay, among them we have the famous Inca Trail, Choquequirao (the other Machu Picchu), you can also do incredible hiking trails to the snowy Salkantay and Ausangate, adventure routes such as Lares, expeditions to the jungle of Cusco and countless more activities, almost no tourist destination in the world offers you so many things and in one place like Cusco. If you want to visit Machu Picchu, Cusco and all its attractions, contact us at info@boletomachupicchu.com, we have the best tours and different travel alternatives for you.